Are you an avid sports fan? We all have our favorite teams, our favorite sports—NFL, MLB, NBA, NHL, MLS, college football, and the list goes on. I grew up just outside Philadelphia which means I will forever cheer for the Phillies and Eagles. It’s in my blood! Over the past few years, like a lot of fans, I’ve become disillusioned by the off-field antics and more seriously, crimes, of professional athletes. Their skyrocketing salaries, crazed celebrity status, and unrealistic ticket prices have also affected me. I’m generalizing here, and of course there are exceptions. But very few wonderfully talented athletes seem to maintain “real” lifestyles including a healthy balance of family life. There are so very few real heroes. But for about the past 10 years, all three of my children have been involved in sports activities. And there is no greater experience—for both the kids and us as parents. This is where my heart now lies; professional sports, step aside! My children’s involvement with sports began with AYSO soccer, a wonderful program that teaches basic soccer skills and good sportsmanship. There are hundreds of AYSO programs in communities across the country—all run by volunteers, mostly parents like you and I. Soccer is an awesome sport that not only encourages physical fitness because it includes a good amount of running, but it also enforces the importance of teamwork. Tennis – This is a great, life-long sport and included some of the best-mannered high school girls I have ever had the pleasure of knowing. Track — Similar to soccer, I believe all kids can benefit from the simple exercise of running. Although kids are competing as part of a team, there’s also the personally rewarding aspect of competition with yourself—to continually beat your personal records (PR’s). The vast majority of coaches, parents and teammates we’ve met through the years have been amazing, inspiring, supportive and positive people! 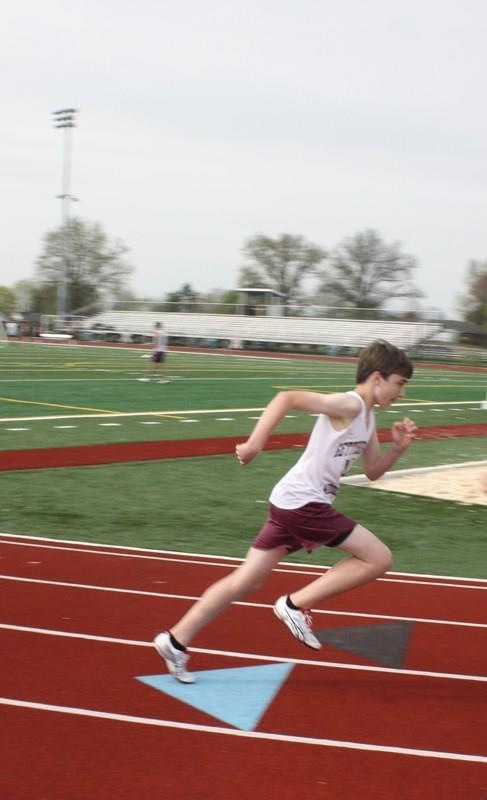 My son Kyle has a beautiful stride on the track! We’ve had a few brushes with ugly situations along the way… parents getting out of control on opposing teams, parents at my son’s AYSO games using profanity, and situations involving my husband who is a referee—one of the most thankless jobs there is. Even going back to kindergarten, during the days of co-ed AYSO soccer, there was a boy who punched my daughter in the stomach because he couldn’t accept the fact that my daughter scored on him! This past year, we’ve had several situations with one of my daughter’s 14-year old teammates as well as the girl’s mother, acting out of jealousy over my daughter’s talents; the mom even resorted to sending me “hate mail.” Craziness! But put into perspective, they are all life lessons—chances for us as parents to model good character, take the high road, and lead our kids by example through difficult situations with real life lessons. As a parent, there is no greater joy than seeing all the hard work and practice that your children pour into sports pay off when they achieve their goals on the soccer field, tennis court, track, etc. There are enormous mountains and valleys that we, as parents, see our children through. I have encouraged my kids to stick with sports during tough times when they’ve wanted to quit, and there have even been heart-breaking injuries that required physical therapy and time to mend. All of those struggles make the victories that follow, even sweeter. And by “victories,” I don’t necessarily mean “wins” in terms of the score. My husband and I simply try to encourage our kids to always do their best in all things—sports, school, and in situations requiring good character. Those are life’s real victories. 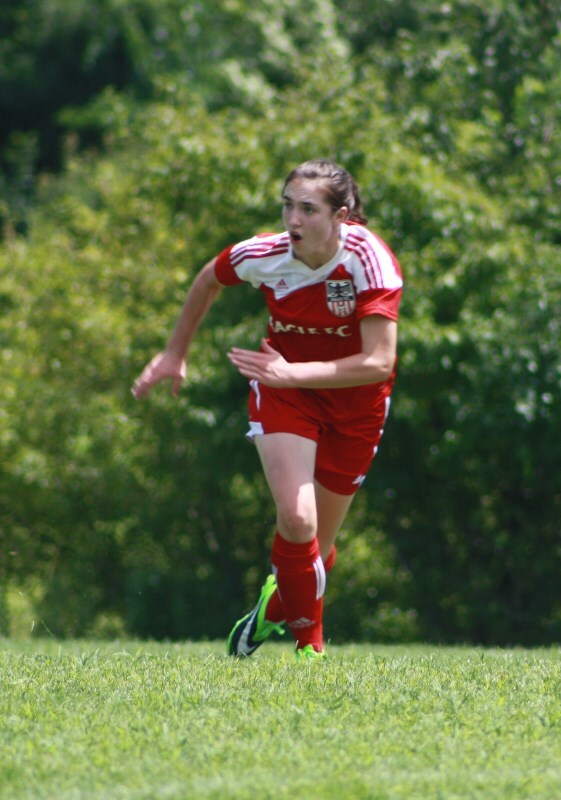 My daughter Kelly, in action on the soccer field! Now, on the rare occasion when I watch professional sports, the games seems empty and meaningless. Nothing keeps me on the edge of my seat more than watching my own children and their teammates compete, struggle, persevere and excel. Quite often, it brings tears of joy to my eyes! Which is why I feel as though our youth are the TRUE heroes within today’s sports community. What are your children’s experiences with sports? How have sports benefited their character development? How do their sports experiences affect you as a parent? What do you think of professional sports? I’d love to hear your thoughts…. Many thanks, Robyn, for your comments… it’s always good to know “we’re not alone!” I always feel badly for those kids whose parents set poor examples on the sidelines. And I wonder if the kids will adopt those habits. Oh the stories we could tell from my husband’s/referee’s point of view! That could be another blog topic one day! Good sportsmanship is one of the best gifts we can give to our kids. Take care, Robyn!